No-Bake Strawberry Shortcake Bars are incredibly creamy from the cashew base and taste just like strawberry shortcake! No baking necessary to make these gluten-free, Paleo, and vegan bars. These strawberry shortcake bars, though, were not intended to be strawberry shortcake bars. I had been envisioning a cashew crusted bar, with a lusciously creamy vanilla bean-flavored filling, topped off with strawberry halves. The idea was sparked when I spotted this photo on Instagram (go drool over her whole account too, if you haven’t seen it yet). The recipe built itself in my head, and I immediately scrawled it down in my recipe notebook. 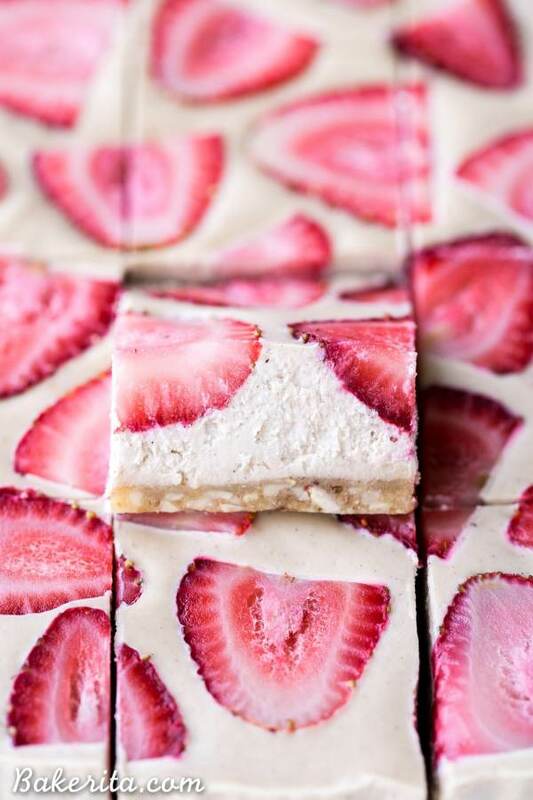 I envisioned them as strawberries + cream bars, or something like that. As soon as I took my first bite though, all I could taste was strawberry shortcake. Without any intention, I replicated the flavors of one of my favorite summertime treats. They were soooo darn dreamy, you guys. First up: the crust! It’s made with cashews and a bit of almond flour, held together by some coconut oil and dates, which also help sweeten it up. A sprinkle of salt, and that’s all she wrote. Get it all pressed into your pan. For the filling, you’ve got to have soaked cashews. This is the most annoying part of the recipe, because it means you need to think about making them at least four hours ahead of time to get your cashews soaking in cold water. This helps the cashews soften up, which helps them blend into the most lusciously creamy filling. Line an 8x8” pan with parchment paper and grease well with coconut oil. Set aside. Add the cashews, almond flour, pitted dates, coconut oil and salt to a food processor or high-powered blender and pulverize until it comes together into a sort of sticky dough, with small bits remaining. Don’t over process, or it’ll turn into nut butter! Press the date dough evenly along the bottom of the prepared pan. In the same food processor or high-powered blender (no need to wash between - I used my Vitamix, but most powerful blenders should do the job), combine all of the filling ingredients except the strawberries and blend for about 2 minutes, or until the mixture is silky smooth and creamy. Scrape down the sides as necessary. You may need to add a bit more coconut milk or lemon juice to get it to blend smoothly if your blender isn’t super high-powered. Pour the filling into the prepared pan over the crust. Smooth out the top and tap the pan hard against the counter a few times to release any air bubbles. Press the strawberry halves into the bars. Place in the freezer to firm up for at least 3 hours before cutting. I recommend running your knife under hot water to warm it up before cutting the bars with the still-hot (dried) knife. Let them thaw at room temperature for 10-15 minutes before serving. 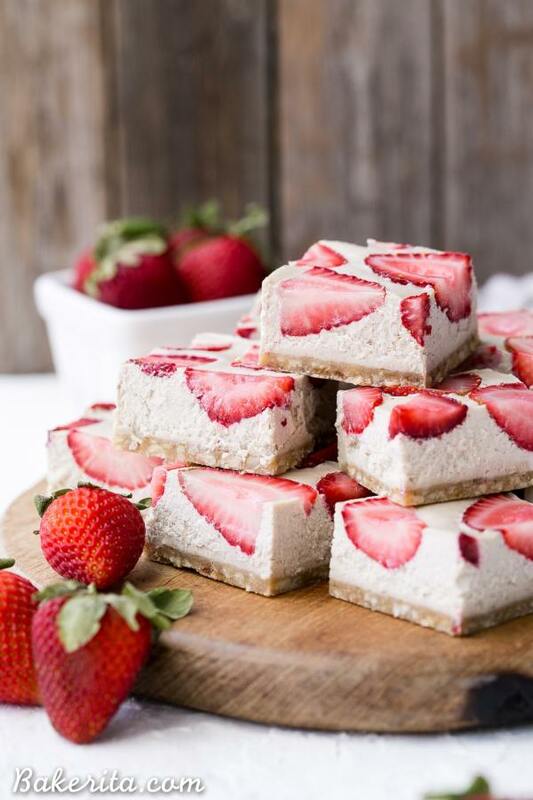 0 Response to "NO-BAKE STRAWBERRY SHORTCAKE BARS (GLUTEN FREE, PALEO + VEGAN)"